Preheat oven to 375 degrees F. Line an 11x8-inch baking dish/pan with foil. Coat foil with shortening/non-stick spray/butter etc. In a large mixing bowl, using an electric mixer on high speed, beat together eggs, granulated sugar, brown sugar, and vanilla, for 4 minutes. 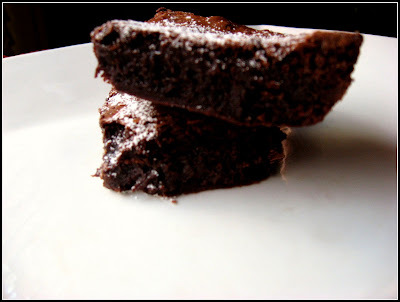 18 comments on "Chewy Fudge Brownies"
I suppose that belonging to Brownie College would mean that I have to eat them? Not that that is a terrible thing, but I would have to do a lot of experimenting and my hips would rebel!!! Wow, you shouldn't be just the dean, you should be chairman of the board of Brownie College. Can I ask a small question? Don't fail me if you disagree. Is one allowed to add nuts, especially toasted yummy Pee-Can nuts to brownies or is that cause for immediate expulsion? Valli- At BU, we expect all students to eat the brownies they make. Your hips will have to deal with it. Sue- I am the dean, chairmen of the board, teacher, nurse, counselor, and track coach at BU. Are you interested in applying? You can be on the BU track team, too. Nuts would be delicious!!! I love adding nuts to brownies, but I don't think the fam. likes them. We had a brownie bake-off at our company picnic one year. Wish I had known you then. I always 'feel like a nut' so I put 'em in there. I love brownies - how do I apply?? I think I need to attend - I haven't made brownies in way too long. And I have never done brown sugar in brownies - these sound tasty? Mmm, brownies! I have this one recipe for low-fat brownies (I know, but I only make it because it's really fast) that calls for the eggs to be beaten with the sugar. It does give it a great texture. Brownies are wonderful. I wouldn't want a straight diet of brownies, but I definitely need a pan every two months or so. I love adding toasted pecans to mine. And chocolate chips. Sign me up for Brownie U, love it! Oh, I would definitely apply, and can only hope I have the right qualifications. I completely admire your dedication to the perfect brownie; good luck with the quest and I'll read with interest. 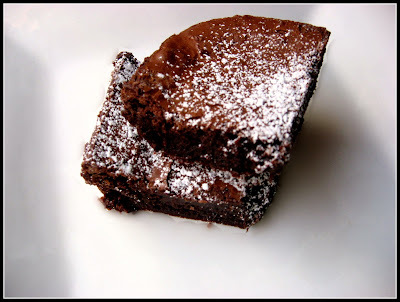 You probably have made the perfect brownie many times and just don't know it because you are obsessing over them. I know this because I am the same way. BTW, why do you put the pan in cold water and then freeze? I am assuming to stop the cooking like "shocking" with vegetables. And the freezing..to make them easier to cut?? How do I apply to B.U????? :-) You are so funny! So this may be a stupid question but is the reason you put it in the fridge to cool it off faster or does it change it chemically? Anj- A brownie bake-off sounds fun. I want to be in one. Deborah- First you have to take your ACT's and then you can apply. I like using a combo of granulated and brown sugar. More flavor and moisture. Mallow- It IS hard not to eat the whole pan. Do one a day. Or maybe two. Christina- I saw a low-fat brownie recipe in Everyday Food, that looked good. It called for reduced-fat sour cream and applesauce. Brilynn- Send me your application immediately. School starts on the 14th. You will need a ruler, markers, and Elmer's Glue. Brandon- WHO ARE YOU??? Your profile could use some sprucing up. All I know about you, is that you've had 5 profile views. Send me your application to B.U. including your ACT information. See above for your school supplies. It does cool the brownies off faster, but it also changes the texture. It makes them fudgier. Basically you're stopping the cooking process faster. that brownie college logo looks so cute! so are those brownies! That's all I can think of to say right now. Just yum. Food blogging is so addictive! The search for the perfect brownie sounds like a tasty endeavour. These brownies look really good.